“Pole barns” were established years ago as an inexpensive method to construct a building for purposes not extremely important. They were used primarily for agriculture purposes. With today’s technology and innovation, post frame buildings can be used for anything any other building methods are used for. Since the creation of Perma-Columns and other permanent foundation methods for post frame, post frame buildings are now being used for homes and offices. Since post frame is less expensive than conventional framed, your home will be less expensive when constructed as a post frame building and not conventionally. The building will last just as long as a conventional framed building, but will cost less. 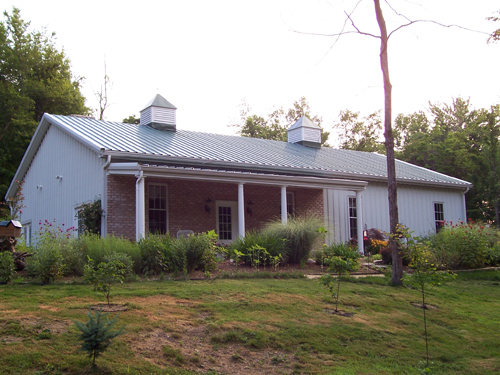 Your post frame home does not have to look like a “pole barn”. With countless accessories available and alternative siding and roofing, your home can look just as nice as any other home you see. You can use any type of siding or roofing to give you a more conventional exterior home appearance.